hanging art | Odd Job Handyman Services, Inc. Odd Job’s family of clients – homeowners and corporations alike – know that we live up to our name. Everyone has chores that they avoid getting around to and would prefer to hand off to someone else. Some of them are difficult and even dangerous. A perfect example of this is hanging pictures, artwork and other valuables, a specialty of the Odd Job Team. There are many, however, who are understandably horrified at the thought of paying for a service that might seem well within their ability. The fact of the matter, is that hanging art safely, properly and in a way that brings the most out of it is a skill much like any other. Improper execution will very likely result in your art eventually falling, causing damage to it and the wall as well. In this article, we will share some of the methods we employ to maximize the beauty of your home gallery so that what you hang receives the admiration it deserves. First and foremost among the tricks of this seemingly simple trade should be ensuring that it is easily visible – in other words, not too high and not too low. The center of the picture should generally be 57-60 inches above the ground, placing it at eye level for the average person. We use the word ‘generally’ because there are other factors that would obviously have an effect on this, such as the height of the ceiling, the home’s occupants and the purpose of the room. 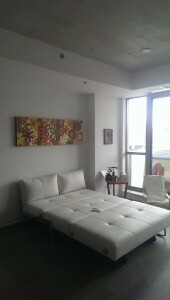 It wouldn’t make sense, for example, to hang art too high in a room intended for lounging around! The key here is to visualize how your art will appear to those in the home, not simply the quality of each piece. This brings us to an issue of even greater importance: setting. Once again, we must stress that it is vitally important to consider the nature and purposes of the room before hanging art there. Art is all about expression, and that by definition means something different to everyone. 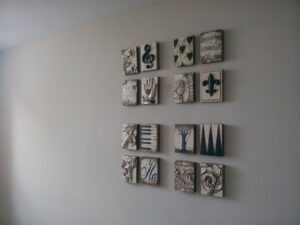 This is why many artistically-minded individuals frown on the concept of rigidly matching artwork to decor. Whether your perspective is practical or abstract, however, it cannot be denied that what you hang will have a symbiotic relationship with its surroundings. The more pragmatically-minded are less interested in art as a vehicle for making statements as they are in using it to evoke emotions – positive or otherwise, depending on their mindset. Nonetheless, the wrong setting will send both of those vehicles down a dead-end street. 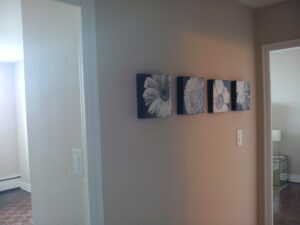 So how can the homeowner be assured that their art jives the right way with their room’s decor? Some of the factors that should be rather obvious: colour, for example. Neutral colours (such as beige, khaki and gray) create a more calm atmosphere, whereas the opposite effect is achieved with more vibrant shades. A few weeks ago we published a more-detailed article about the psychology of colour, and how the hues you use have a powerful effect on the vibe your room sends to its occupants. All of this should be taken into account when trying to decide which piece of art is right for which room. Since it is ‘wall art’ we are discussing, the walls themselves are highly significant – not just in terms of colour, but size as well. As a general rule, match the smaller pictures to narrow walls and save the larger works for those big empty spaces. 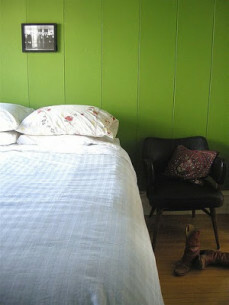 Perfectly aligned with the bed – Odd Job Style! Can you see why we WEREN’T here? Another crucially important part of the relationship between wall art and its setting is furniture. Many people like hanging art directly above couches, tables and other fixtures of the average living space. This works very well when performed correctly.The most important thing to remember is that the piece should not be wider than the furniture it hangs above, as this results in an awkward and uneven aesthetic. And it can’t be too narrow either – just look at the disaster on the right again! It’s often said that the art should be around 75% of the width of the furniture below it, but a perfect match (as seen on the left – a picture from one of our many successful art hanging projects) also works very well. The more ambitious homeowner may want to ensure their artwork is given the appreciation it deserves by installing lighting and remember, we can do that for you too! Be very careful not to overexpose your artwork to light. This can cause the colours to fade, and also does damage to both the paper and the textiles. This is why art galleries ensure that while the works they display are properly lit, the light levels are highly controlled. Light is measured in lux. Museums generally allow paintings to be subjected to 150 lux, while art on paper is allowed no more than 50 lux. Art that hangs in the path of direct sunlight is being to around 20,000 lux. If your artwork must be positioned directly across from windows, use blinds, drapes or other window treatments to reduce exposure. In addition to controlling light levels, avoid using any ultraviolet lights. Ultraviolet light is not only damaging to human skin, but to art as well. In fact, it is more damaging to it than any other form of light on the spectrum. Use incandescent light (which has no ultraviolet portion), ideally shined from low-wattage bulbs and at a minimum level of brightness. In the home improvement field, making things work is only half of the toolkit. Odd Job is passionate about creating the right aesthetic and with it the ‘feeling’ that the homeowner desires. In this respect, our team views home improvement itself as a form of art, and we observe a home from an artistic perspective as well as a technical one. This is why you can not only trust us to hang art safely and properly, but with respect. Call us today at (416) 520-1161 or book our team online.